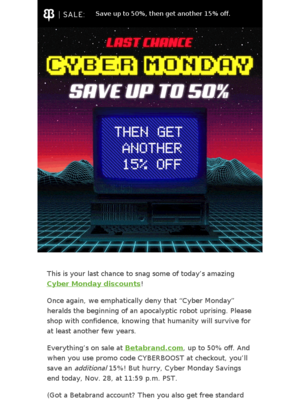 Below you’ll find the canonical reference for Cyber Monday email planning. From email examples to specific promotional strategies, we’ve included everything you need to ace your campaign. Here's a great Cyber Monday email. We love the animation (it makes us want to fire up our old Super Nintendo), and the copy is squarely in the Betabrand voice. The value prop and offer codes are easy to read, and the preheader cleverly gives the reader a reason to think it's not just recycling a Black Friday offer. This email is making us a little sleepy. 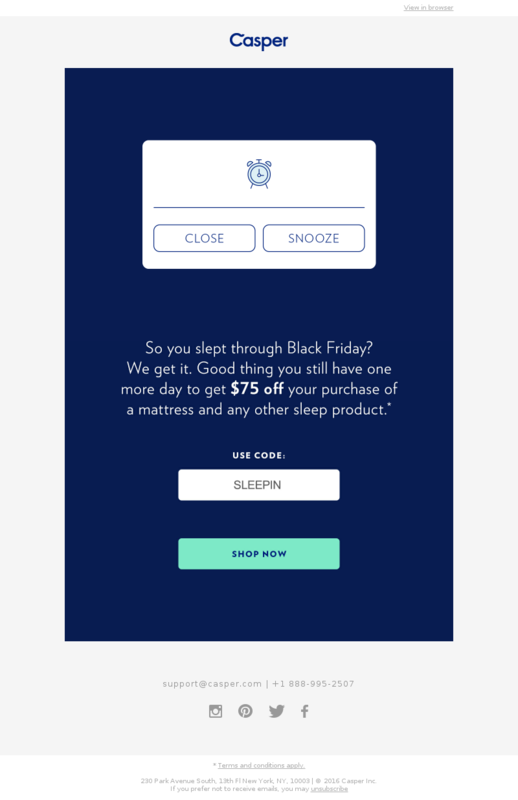 Everything about it is designed to make readers yearn for a good night's sleep, from the calming colors to the quiet but persistent value prop in the preheader. Compared to the near-hysteria in other emails, this message is a restful haven. Every other brand in the inbox is trying to sell you something. Here's a sender that just wants to play but also is serious about selling. The "mystery deal" piques curiosity, and the CTA encourages readers to play. Once they hit the site, the selling can begin. We hope the brand manager was on board with that subject line, but the payoff inside the email is a great use of a countdown timer to stress urgency. Musicians Friend also is channeling its Cyber Monday energy to boost its mobile app with a good benefit statement. Many brands miss that opportunity. 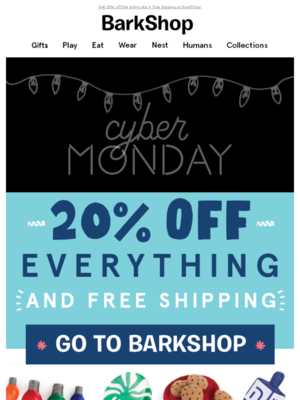 The subject line dances a little close to the edge for a mainline brand, but Barkshop can pull it off because it speaks to a narrower slice of the pet market than a general retailer like Petsmart or Petco. We love the animation and attitude of this email as well as the sender name, which adds a name to the brand to make it stand out. 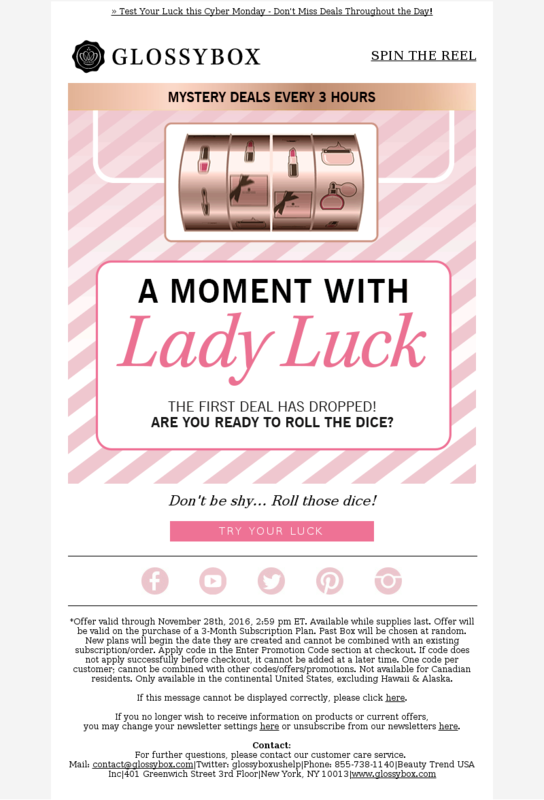 Start planning your Cyber Monday email strategy with great examples. This Indochino email calendar is based on INDOCHINO, who sent 6 emails for Cyber Monday in 2018. This Gant email calendar is based on GANT, who sent 0 emails for Cyber Monday in 2018. This Dannijo email calendar is based on DANNIJO, who sent 0 emails for Cyber Monday in 2018. Will you simply send one email on Cyber Monday or will you send a few emails leading up to it, including a “last chance” email once the event is over? Based on 8453 emails mentioning "cyber monday" in the subject line. Discover the most popular types of promotions used for Cyber Monday. Understand how steep a discount companies offer for Cyber Monday. You can toggle between Dollars Off and Percent Off. 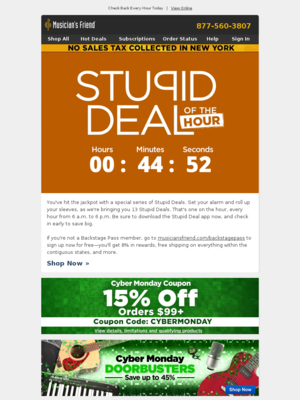 Ace your Cyber Monday email content with these ready-to-implement strategies. Enjoy! Cyber Monday is one of a string of designated shopping days that includes Thanksgiving Day, Black Friday, Small Business Saturday (an American Express invention) and Giving Tuesday (created by the 92nd Street Y’s Belfer Center for Innovation & Social Impact in New York City). Beware of subscriber burnout: Recognize that shoppers have been subjected to a relentless stream of commercial emails since long before Thanksgiving. Many brands also ramp up frequency, switching from weekly or twice-weekly sends to daily, twice-daily and even more frequent sends. A steady flood of undifferentiated email offers are likely to make your own emails invisible in the inbox. 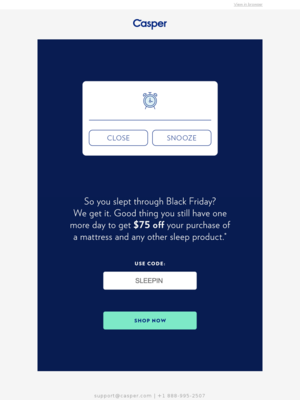 As with Black Friday, creativity and value proposition are your two best friends with Cyber Monday messaging. Let’s dive into some specific strategies you can leverage. Deliverability experts warn against changing tactics unexpectedly — especially during the high-volume launch of the holiday shopping season. ISPs are quick to jump on sudden shifts in email habits, such as a sudden increase in frequency, sending from untested IP addresses or moving from modest targeted sends to heavy broadcast deliveries. Bombarding your entire list with hourly offer updates might satisfy your Cyber Monday plan but it could torch your deliverability and get you blacklisted for the rest of the holiday season. Plus, it can burn out your subscribers, especially if you aren’t in their inner circle of brands whose emails they seek out and open no matter what the subject line says. Look for ways to ramp up frequency logically and strategically in the weeks before the Thanksgiving weekend crush. Pro-tip: Give subscribers the option to opt-down rather than opt-out. 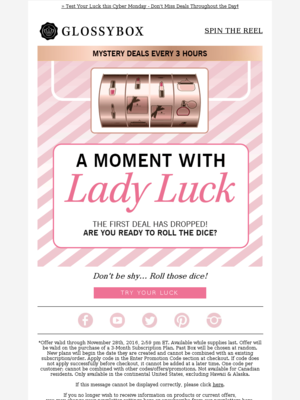 As we reviewed Cyber Monday emails from past years, we were struck by the lack of targeted and personalized emails. Brands frequently sent the same email both to a general audience and to their best customers – the ones with a purchase history! Show your customers you know who they are and what your relationship is. Personalization is one tactic, but it’s just the start. Segment your VIPs – past buyers, regular open-and-clickers, anybody on whom you have activity data – and send them special offers. This is the challenge to overcome throughout the long post-Thanksgiving shopping weekend. Your emails have to stand out against all of the other messages flooding inboxes. 1. Coordinate the sender name, subject line and preheader. Your subscribers use all three elements to decide whether to open your emails. Sender name: We like Gap’s tactic, creating a new sender name just for the day (“Gap Cyber Monday”). No matter what, though, be sure the sender name mentions your brand, not the name of the person who sent the email. Avoid the obvious. Everybody knows it’s Cyber Monday, so don’t waste those 12 characters by saying “Cyber Monday starts now!” (especially if your email goes out at 10 a.m.). That’s why putting it in the sender name, as Gap did, is genius. Preheader: As we reviewed Cyber Monday emails we saw nearly all brands using custom preheaders supporting the email subject or content. If your preheader still says “View in a browser” or “Add us to your address book,” you’re falling behind your inbox competitors. Use that valuable space to promote a secondary offer or flesh out your subject line. 2. Resend your email campaign. No matter how well you build your inbox presence, your email could get overlooked in the crush. Reach out again by sending later in the day to people who didn’t open it the first time. But be strategic. This tactic can backfire if you don’t think it through and test the impact it may have on your list.